Since the ezine’s inception in 1999, I’ve always posted Reader’s Tips “from” name as full first name and last name’s initial. Unless anyone objects, I’m switching to full name because I feel tips submitters will get a little more satisfaction that way. I certainly would, and with just a name (not an email or physical address) privacy is still not a concern. Of course, if I’m requested to post a name in a certain way or asked to use an alias, I’ll always comply. I’m open to feedback on this policy and comments are welcome. This past Saturday I had the pleasure of joining a new campaign as a player. The GMing was excellent and I rubbed shoulders with some very skilled players. This is going to be a great campaign! Below are a few tips and observations I made from a player’s perspective. I don’t get many tip submissions for players, so hopefully these are of value to the player subscribers out there. Cut scenes have been mentioned in the ezine before and are usually a GM technique. However, a fellow player in our game initiated a cut scene and it worked very well. If certain basic rules are followed, player initiated cut scenes are a wonderful technique for improving game play. In Computer Roleplaying Games (CRPG), a cut-scene is a non-interactive storytelling sequence that usually involves video or high-res computer graphics. My definition of cut scenes for tabletop RPGs is that they’re short narratives or expositions that reveal information about the game world, PCs/NPCs, or adventure plot. They’re non-interactive and don’t need to be synched to the time line or present actions of the PCs. They’re useful for providing clues, atmosphere, drama, and entertainment to game sessions. First, second, and third person narrations are acceptable, though if the player’s PC is involved then first person (in- character) is best. Player cut scenes usually involve the player’s character, but that’s not essential. Inject cut scenes with some kind of emotion, such as humour, drama, or empathy, to make them interesting. Nobody enjoys listening to a long, boring, flat narration. Keep the scope of the scene as narrow as possible to avoid treading on the GM’s feet. Do not script the actions of other PCs. Do not significantly change or impact any in-game element. The GM might have plans of his own and you don’t want the GM angry at you! Leave the ending open to provide the GM an opportunity to weave it into his storytelling without extra effort. If the cut scene takes place in the present, keep the scene’s time line very short. You do not want to script too much or the GM will be forced to backtrack your scene so as to synch it to other events that are happening. This method of note taking might not suit every player’s style, but it worked quite well for me. It was an idea I borrowed from a player in a campaign I’m GMing (Hi Bimp!). Use Post-It Notes to record session notes. Their small size forces brevity and the sticky factor makes cataloguing them flexible and easy. I usually take notes using writing pads, notebooks, or letter size looseleaf, so trying out the Post-Its was a new experiment for me. What I find sometimes is that extensive note taking becomes a chore and a distraction. I’m trying to record every action and piece of information and end up focusing on journalizing instead of playing. Post-Its forced me to be brief, freeing up a lot of time for me, while still creating a useful campaign reference. With Post-Its, you can categorize them and stack them. For example, you might have separate Post-Its for NPCs, locations, and game world tid bits. When a note gets full, grab another from the pad and stick it over the previous note for that category so you can flip through them quickly. Pictures. The player I’m GMing creates wonderful thumbnail sketches of magic items and creatures fought, one per note. Magic item Post-Its can be passed around as ownership changes. Creature sketches can be placed on campaign maps as colourful callouts. Figure bases. With the recent D&D rules revisions, figure/mini base sizes no longer reflect the facing stated in the rules. For example, a horse fig’s base might be 1″ wide and 2″ long–perfect for the old 5×10 facing. The new rules square off all creature facing though, so a horse is now 10×10.A quick solution is to cut up a Post-It to scale and stick it to a fig, so 2″x2″ for the horse example above. Place it sticky side up so it adheres to the fig and not the battlemat.My first inclination was to place the horse fig dead center of the trimmed Post-It. However, another player had a great idea and right-aligned the horse on the note to make room for placing a rider fig on the left-side. Spells and powers. Make a library of abilities and their rules for fast reference during play. My GM had definitely mastered the D&D rules set and it showed during play. Pauses for rules research and page flipping behind the screen were almost nil and this translated into very smooth play, more storytelling, and a fun time.Players should master the game rules too, for the same reasons. You don’t have to master every rule though, just the ones important to your PC.For example, if you’re a warrior you should have a good grasp of the combat rules and options. If you’re a spell caster, get those spell stats and mechanics down on paper or in your head. Volunteer to do the rules research in-game whenever needed. This is one of the best ways to master a rules set, unless your group has minimal rules issues. You’re forced to learn how the rule book is organized. You’ll learn where to find rules and be able to find them quickly. Reading the rule will help you remember it. Then explaining the rule, reading it aloud, or paraphrasing it for the others will reinforce in your brain what you’ve just read. Record rules pertinent to your character on a reference sheet. Do this during the session when you’re not busy or between sessions. Again, this helps you learn where the rules are in the book and is a good memory technique. Create a spell library spreadsheet. This is another tip I can credit a fellow group member with. Recording spell stats in a spreadsheet program, such as Excel, will help you learn the rules and create a customizable resource for future PCs. Sure, you could find the spells online and paste them in, and if you’re pressed for time that’s a good method, but reading and typing them in manually definitely helps you learn the rules. Read the rules when you’re bored or inactive. In-game, general rules research keeps you quiet and out of the GM’s hair. 🙂 During the action, make a note of any rules employed that you’re not familiar with and then research them when you’re not busy and your attention isn’t required.Between games, rule books make great bathroom and transit reading. It’s also easy to digest a rule or two during the commercials of your favourite cartoon show. A final note to GMs. When I GM I put pressure on myself to employ the rules correctly, seamlessly, and gracefully. This is a personal goal and one I’m always trying to reach. Sitting on the picture side of the screen though, I was quite happy to let my GM gloss over rules issues for the sake of game play. Make a decision, keep it consistent until an official ruling is found, and move on. My fellow players felt the same way. Out of this experience I’m taking away the knowledge that the players want you, the GM, to be successful. They won’t care if you make mistakes as long as you’re fair and consistent. So, don’t put extra pressure on yourself to have perfect rules mastery. That will come with time and experience. Roleplay with the purpose of enhancing the game session in some way. Gaming in-character with other idle players is a wonderful tool not just to pass the time, but to reap a number of game benefits as well. Exploring character personality. This was the first session of the campaign and all the characters were new to us. 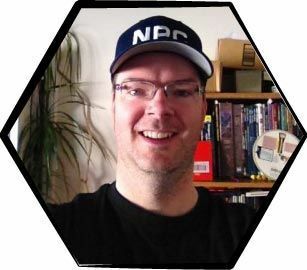 I found that roleplaying with other PCs helped me explore my character’s personality in an “unofficial way” so that, when an important game moment happened with the GM, I was ready to roleplay with confidence and consistency. Generating character background. At the game session, we made characters, got some one-on-one time with the GM to discuss basic PC info, and then immediately jumped into an encounter. During idle times during the encounter, I was able to learn more about the campaign world from the other players by roleplaying with them and exploring what they were told during their one-on-ones.This new knowledge helped me flesh out my PC’s background a bit more. Also, being asked questions such as “What do your parents do?” forced me to think about those things. The fact that it was on-the-spot also helped exercise my creative and RPing skills. Drawing shy players out of their shell. Try to roleplay quietly with shy players, people new to the group, and tired players. These player “one-on-ones” can help draw others out so they’re more participative. I usually GM and boy, did I ever find it hard being quiet when I wasn’t involved in the play or RPing with another player!First off, my personal point of view is that if I don’t have anything to contribute to the game then I should keep quiet. I should do some rules research, catch up on my session notes, or turn my character sheet into a work of art. The squeaky wheel gets the grease. If you’re quiet you might fall out of the loop and get less spotlight time. The GM might overlook you and possibilities to play are lost. No news is good news. The GM might think your quietness indicates you’re busy and not want to bother you and more possibilities to play are lost. What’s that matter? Some players might mistake your quietness for moodiness. Learn to quickly identify who the spotlight is on. That’s your cue not to bother the GM or that player. Feel free to roleplay with other willing players as long as your noise level doesn’t exceed the GM/player’s. Use eye contact and body language with the GM so you communicate that you’re available to interact at any time. For example, you could simply smile, raise your eyebrows, or mime what your character is currently doing in his idle state. To assume or act out a particular role. – Dictionary.comWhether you enjoy combat, acting, exploring, solving puzzles, or hanging out with friends, do your best to roleplay your character and not superimpose your own personality and abilities over him.This has many benefits, and I think the biggest will be getting caught up in the spirit of the game. Pet peeves, bad habits, and personality conflicts will fade away (to some extent, at least) and it will be just you, your imagination, and some good gaming. Get a good measure of your character. Your character sheet is a road map. It’s a set of instructions, parameters, and descriptors. Your job is to figure out how your character expresses this information. Look for strengths and high points. Note weaknesses and low points. Figure out how all this manifests itself in the character’s appearance, personality, and behaviour. Push your character to his limits. While you might grow attached to your character, never stop exploring his boundaries. This might materialize as being the sneakiest, bravest, or mouthiest. It should involve taking risks you personally would never consider. It should mean demonstrating great bravado, impeccable style, or cunning parley. Allow your character to be bigger than life.Characters are fun to play, but I think it’s their legacy that is most important. What PCs do you remember the most after a campaign or game session is long done? Which characters do you tell stories about? Which characters of yours do others tell stories about? Try to place each and every one of your characters in this fondly remembered, elite group. I feel the benefits of leaving a legacy like this far outweigh the potential disappointment of a character’s failure, embarrassment, or death — and it’s often these very things that put a PC on the hall of fame road in the first place. Learn to translate numbers into imagery. Regardless of whether other group members speak in numeric or descriptive terms, you can make it your goal to translate all the mechanics into something graphic in your mind’s eye. This helps you remember session events, but it also creates a mental environment that will draw your character out and bring him to life.It’s difficult to roleplay by thinking of an action as an 18. Instead, if let the GM know you got an 18 and he might say “you hit”, try to imagine it as a solid blow to your sweating, dirty hobgoblin foe, your character’s face revealing grim determination and a mocking grin of imminent victory. You are not your character. Your character’s failures are not your own unless his failure is lack of participation or not living true to form. Don’t take failed actions personally. With my style, I enjoy GMing the day-to-day lives of the PCs as they evolve into fine adventurers and heroes. However, when the game is continually run on a day by day, or even hour by hour basis, it starts to get unrealistic. How much can a character really improve in 24 hours? How can I let my game world change in the background when the time line advances so slowly? Wouldn’t the PCs get burnt out after packing so much adventure in such a condensed time frame? So, my tips request for you this week is advice on switching from micro character management (i.e. “Ok, the monster is dead, what are you doing now?”) to longer time frames (i.e. “Ok, the monster is dead, the village celebrates, and three weeks pass.”) with grace and efficiency. Perhaps you have some planning advice to prevent this problem from happening in the first place, or some in-game storytelling techniques for this? While miniatures convey a lovely atmosphere and embody the attributes and attitude of characters, they don’t always work so well for NPCs. In our group, we instead use 25x25mm cardboard squares. On one edge is a small arrow to indicate which way it is facing. And in the middle there is the NPC’s name or an identifying number/letter (“A”, “B”, “C”…). The number and arrow are drawn in thick coloured felt-tip pen so that they are easily visible from around the table. During combat, if the players need to annotate the tokens, they can. They are so cheap to produce that they can be scribbled on, flipped over, torn up, and then, when necessary, easily replaced. By allowing players to write on the NPC tokens, they can put what they think is necessary and not what the GM thinks is important. Over time, the players have developed their own unwritten battle code to annotate them. For example, “Sw” indicates “Sword”, and a little spiral indicates “charmed”. Because it is up to the players to annotate the detail, they pay attention to the descriptions and decide what is important to them. This in turn helps them gain an improved perspective of the situation, resulting in better battles and less need to describe over and over which NPC is doing what. It’s important to consider psychology when granting rewards to characters (money, items, etc) or players (experience points, etc). It’s observable that to many people, constant small rewards are ultimately less satisfactory than infrequent large rewards (in the same way that Christmas is more enjoyable than receiving one small gift a week and never getting Christmas). An example of this is the number of lottery winners who take all their winnings in a lump sum, despite the fact that a long-term payout in small amounts would produce a larger total. There are two operative principals at work here: Frequency of Reward and Size of Reward. The idea behind determining the correct frequency of rewards to bestow is anticipation. A player must be given an opportunity to develop their own desire to be rewarded. If a reward comes with no struggle, effort, or delay then part of its satisfaction is gone — proper anticipation colors a reward with layers of emotional significance so that when it is received, it’s like two rewards in one. However, a reward too long delayed or too hard won makes a player question whether the effort or time involved was worth the result. The player’s emotional response to the reward makes it seem less than it actually is. Therefore, we must strive to identify that point when desire is highest and disappointment has not yet begun to grow too strong – and deliver an appropriate reward at this point. In a pinch, surprise (wherein the player was never aware reward was available in first place), can also appease a player. Surprise has the advantage that there is usually no disappointment or anticipation involved — a player can enjoy reward without it being colored by either mindset. The idea behind determining the correct size of reward is significance. If the reward has no significant impact on the character, then it’s not a true reward. Giving a copper pence to a wealthy prince with vaults of gold is meaningless — unless it’s a copper pence stained with the blood of his father or some such. Similarly (but more constrained), a player reward must be significant. Giving 5 xp to a 10th level character is likely to draw a “why bother” more than a thanks from some players. A player must feel that reward will meaningfully affect his character for it to be valued. Again, we must be careful that we don’t overdo it. A single reward should not unbalance the game or seem to favor one character too highly over the others. Too large a reward may cause an inflation in further rewards in order to continue to engage players. Something as simple as balancing effectiveness against usefulness (i.e. a powerful magical horn that can only be blown under a full moon) can allow a reward to seem larger than it is in eyes of players without affecting the careful reward economy the GM already has in place. In summation, rewards must combine anticipation, the ability to see meaningful improvement to a character as a direct result, and the appropriate distance from each other in time for both character and player. Anticipation and Significance are two axis against which most rewards can be judged, both for player and character. “There was a man named Valgard, he kept house at Hof by Rangriver, he was the son of Jorund the Priest, and his brother was Wolf Aurpriest (1). (1) The son of Ranveig the Silly, the son of Valgard, the son of Aefar, the son of Vemund Wordstopper, the son of Thorolf Hooknose, the son of Thrand the Old, the son of Harold Hilditann, the son of Hraereck Ringscatterer. The mother of Harold Hilditann, was Aud the daughter of Ivar Widefathom, the son of Halfdan the Clever. Ranveig the Silly? I think I prefer Halfdan the Clever. Peruse this saga for a veritable treasure trove of Viking and Icelandic names.